Asra Nomani leads a mixed-gender prayer service near the Brandeis chapels. On March 23, 2005, the Institute brought former Wall Street Journal reporter Asra Nomani to Brandeis University to give lectures and lead prayer services. She spoke about her career in journalism, about the beheading of her close friend and fellow reporter Daniel Pearl, and about her quest for Muslim women's rights. Nomani, one of Pearl's best friends, was living in Pakistan when Pearl was kidnapped by extremists. Nomani was devastated that men acting in the name of her religion had brutally killed her friend, whose last words were, "I am a Jew"—and was spurred on to her personal odyssey to discover the "truth" about Islam. Author of Standing in Mecca: An American Woman’s Struggle for the Soul of Islam, Nomani led two traditionally forbidden mixed-gender prayer services at Brandeis—one at the Brandeis Women's Studies Research Center and the other outside the campus’s three chapels. 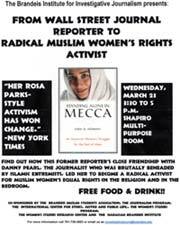 At Brandeis, she was embarking on the "Muslim Women's Freedom Tour," advocating for an Islamic Bill of Rights for women in mosques and another for women in the bedroom. Photo caption: Nomani’s visit at Brandeis attracted national and international media, including television correspondents whose programs air in predominantly Muslim countries.